My road to addiction started in ’72 after I first saw those enormous coloured fish for sale and I realised I would have to get one for my truly wonderful new garden pond. It all seemed harmless enough on that fair summer’s day in Cheshire. The owner called them ‘Koi Carp’ and, after hearing those two words, so did I for the next few years. My first purchase was ‘an Assagai’ so the man said, I liked it because it had a blue-grey colour on the body and it was different to the others. The others were red and white and appeared to me to look just like big, boring goldfish and I could buy them ten at a time for a few quid anywhere. No, these were ‘special’; I loaded the plastic bag in the passenger foot-well of the car, turned the heating off and drove home carefully ensuring there would be no heavy braking on the way. Later that day, I carefully floated the bag on the surface of the magnificent pond which was to be a perfect home for my new Assagai (I kept repeating the word to myself endlessly). The masterpiece of a garden pond had been excavated with my own hands and the soil removed was used to make the rockery you can see in the pictures. In truth, the rockery, for me was just as important as the pond and I made many journeys to find the right conifers and heathers. The excavation was made to incorporate a shallow ‘shelf’ around the perimeter after the liner had been installed as per the instructions, to accommodate an assortment of water plants to be incorporated in order to maintain the pond water ‘naturally’. Fortunately for me, the same place that sold me the liner, the pump, the hose, the fish and the fish food ALSO had the plants – that was lucky! I thought my pond was very deep (18” at the centre) and my new pet took to it like an ‘Assagai to Water’. I still cannot recall any other Koi fanatic I’ve met over the years who did not go through exactly the same wasted attempts in building their first pond. Like myself it always had to be ‘Mark Two’ or ‘Mark Three’ and there were also plans for a better pond in the future. My first summer with Koi proved to be one disaster after another until, in autumn ‘72, I discovered ‘The British Koi Keeper’s Society’ – that chance meeting was to be an opening for me to be able to leave my twisting, turning, bumpy ‘B-roads’ and turn on to a larger, straighter and smoother ‘A-Road’ on my journey to keep Koi Carp alive. I found this old Polaroid recently and, as far as I am aware, this is the only photographic record left (in COLOUR!) 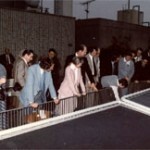 of what must have been the first public exhibition of Koi Carp held anywhere outside of Japan. 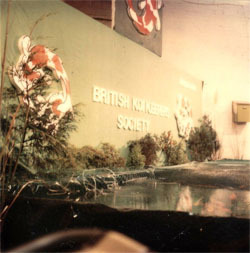 This was the BKKS stand at the 1972 Federation of British Aquarist’s Show at Belle Vue in Manchester. I saw this stand, spoke to the guy in charge and then paid my annual fees of £3.00 to become member No.61 of the British Koi Keeper’s Society, and then my addiction increased. Roland Seal was ‘The Man’ back then, if the truth is known, he was the one who kicked it all off in the UK. He was the Chairman of the tiny Society and, rumour had it, that he also had the finest collection of Koi in the UK. One must recall back then, that there was no information anywhere on pond build methods or keeping methods. We collected some information from aquarium magazines but much of our knowledge came from mistakes made by ourselves and passed on between each other by long evening telephone conversations to the few members dotted around all parts of the UK. Although we thought we knew ‘a thing or two’ – we were all completely in the dark and Roland was the guy who had the only torch with a battery – and that was always on the point of failure! I think it was around March ’73 when I got the hallowed invitation to visit Roland’s pond and days could not pass quick enough for me until I could see it with my own two eyes. The advance publicity from those who had been lucky enough to get the invite previously became more and more of an added attraction for me and, when I did finally enter Roland’s garden, my eyes and mouth opened wide as I began to try and take in what my eyes saw. 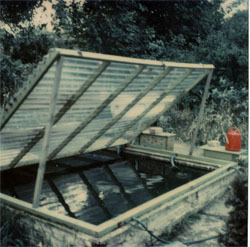 The Polaroid here may not look to be very exciting but, 36 years ago this was Koi keeping beyond belief. Roland was a Koi fanatic whose life revolved around his hobby. 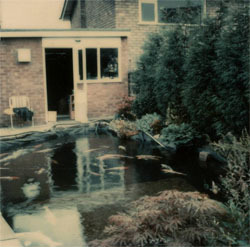 Roland Seal’s Koi pond 1973. The first thing that hit me was the colours of the Koi and the incredible size of them, some were easily 18” long and I watched, mesmerised, as Roland’s wife Pauline came out to hand feed them with prawns. Roland’s eyes were always on the Koi and the pond base – even in summer he grumbled about UK water temperatures and the need for added heat. The pipe to the right of the picture was connected to a flexible pipe that ended near his house sewer and was a siphon, kept in prime always with a cork at one end. By placing the pipe in the pond and releasing the cork the siphon started again and Roland would vacuum every inch of the pond base to ensure there was no debris ever visible. He complained endlessly that our summers were too short and our winters too long, in later years he was always trying to find economical ways of heating his water and not just in winter! His home contained pristine copies of Japanese ‘Rinko’ magazines he subscribed to purely for the pictures. 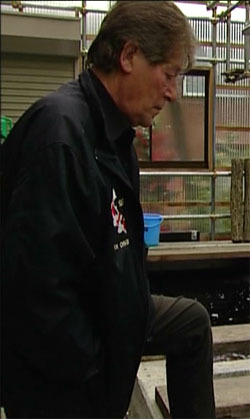 Looking back, if I had to describe what the term ‘Koi Keeper’ really means to me over the years, my immediate thought would simply be ‘Roland Seal’. It must have been Roland’s genuine enthusiasm and knowledge that first really kindled the fire in the young Waddy. I soon began to take an active part in the Society and wrote some articles for our monthly newsletter. 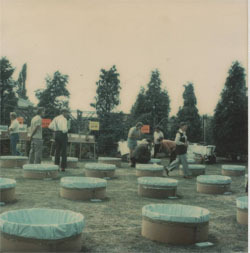 In ’74 Roland mentioned his dream of staging a Koi show and I offered my back garden for the event when I still had a lawn to offer! The pond here belonged to a local member who lived on the eighth floor of some high rise flats. He became infatuated with Koi and, as he had no garden, he ‘claimed’ a patch of land surrounding the flats and staked it out as his! Cyril was an imposing man to behold and kept his pond locked. His armchair overlooked his pond from a window that was always open. He would watch television with one eye and his pond with the other. Next to his chair was a broken, but fully loaded, twin-barrel .410 shotgun, just in case! 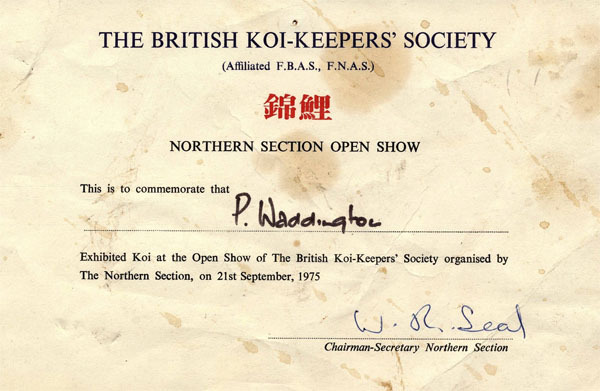 In September 1975 the first ever Koi show held outside of Japan was staged in my garden after many weeks of evening meetings held in the homes of various Northern Section members who were involved in the organisation of it. We had no idea at the time but we were the true pioneers of the hobby and, if I recall correctly, the entire show was financed with a little less than the £85.00 we held in the Northern Section bank account. 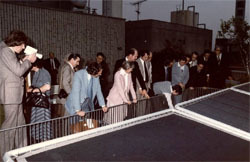 This must be the only remaining colour photograph remaining of the event which shows the benching staff entering the Koi into their display ponds. Around 75 serious enthusiasts attended the show from the most far-flung parts of the UK. I can still recall the atmosphere that day, it was positively electric and the only subject was Koi. All those who entered Koi into this show were presented with a certificate to commemorate this. I still have mine although it is a little worse for wear. The Koi I entered sadly received no awards from the judges of the day but I can still recall the atmosphere of mystery and an opportunity to meet other like-minded people from distant areas. One painfully thin and quiet guy who sported a kaftan, long hair in a pony tail and a beard, bred fish on an isolated fish farm in Cornwall came to check out Koi that he had heard of but never seen before. He wished to produce them on his farm in order to make his fortune. He said nothing to anyone and just nodded when approached. Later in the day he had to speak as nature called, he came over to me and asked ‘Toilet please?’ – I pointed him to the room and asked ‘Are you enjoying the show? He turned round and muttered ‘The fish are lovely, I just don’t like people!’ At the presentation ceremony Cyril, he of the loaded shotgun mentioned earlier, was disgusted to hear his prize Koi had received no award. On being presented with his certificate he promptly tore it up and threw it over the fence as a protest. Within seconds my neighbour collected it, peeked over the fence and then threw it back at him! That was to be my first realisation, of many I would experience later, that judging decisions at Koi shows could be a source of potential discontent. 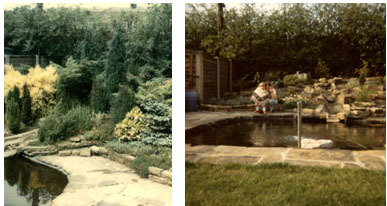 The first-ever BKKS ‘National Show’ was staged in Birmingham in 1976 in the gardens of Ron Hodgson’s home near the city centre. It brought far more enthusiasts as the Koi hobby started to grow, it was also another perfect day for the weather. I recall I had a ‘secret weapon’ at the ready with my Gin Rin Shiro Bekko that received its due award (I don’t recall if any other Bekko varieties were entered!) – whatever, I still have the proof as evidence for the records. My very first visit to Japan in autumn ’77 was so eagerly awaited by me and the days before the flight seemed to drag endlessly until we arrived at Heathrow – after that the time just flew! The trip was organised by the BKKS and led by Roland with 25 Koi fanatics in tow. We took the south route on the outward journey and stopped over for 3 days in Thailand before going on to Tokyo. The return leg came over the north route stopping in Anchorage, Alaska for re-fuelling – no direct flights were allowed over Russian airspace back then. KLM were the cheapest option back then with economy return fare at the ‘snip’ of £1,200.00. In today’s terms I reckon that’s around £8,000.00 give or take! 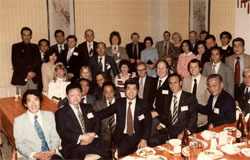 Our stay in Japan was arranged between the BKKS, Kamihata Fish Industries and our sister society ‘Zen Nippon Airinkai’ or ZNA which was the Japanese equivalent of the BKKS but on a far grander scale as we were soon to discover. We were accompanied throughout the visit with an interpreter who, incidentally, had never seen a Koi before but she spoke perfect English. I had read before that ‘Niigata’ was the area to go as far as Koi were concerned because that was where they were actually produced. I knew we were scheduled to visit there for the last four days before returning home but between landing at Narita to actually getting to my ‘land of dreams’ we had to visit Tokyo; Himeji; Kyoto & Osaka first. Our reception was truly lavish at all these cities where we were treated like royalty at the expense of ZNA members each trying to out-do the other in terms of what they could provide us with. We had been pre-warned as to the ‘strict etiquette and rooted traditions’ of the Japanese people and tried to abide by these rules to the letter. It was to be later when I discovered that all this was just ‘tommyrot’, they were just the same as we were in just about every respect apart from the single fact that they removed their shoes before entering a house! Yes, the ponds of the ZNA members were truly magnificent to the point of being incredible. Cameras clicked endlessly taking in Koi that one only saw in pictures plus ponds and filter systems that were difficult to even begin to understand. I asked question after question of our overworked interpreter regarding the filtration systems only to get replies from the owners to say ‘Oh, we did not build the ponds and filters, our local dealers and builders take care of all this, and they also maintain them for us. We just enjoy our Koi and feed them daily.’ My previous thoughts of ‘Koi Keeping’ as a hobby were dashed on many occasions in the company of these extremely wealthy yet very hospitable people who lived in homes that one could only imagine in the wildest of dreams. ZNA evening reception held by the Osaka Chapter of the Society. We were showered with so many gifts and Koi mementos that became harder to carry from hotel to hotel as the days progressed. The famous ‘rooftop pond’ at the Sanyo Securities building in Tokyo owned by Mr. Tsuchiya, a famous Koi collector of the day. This was built on a specially reinforced roof of the building because the cost of land in central Tokyo to build a pond was unthinkable even for someone so wealthy. But there were around ten chauffeur-driven Mercedes available for the top executives or valued customers! I suppose I was disappointed after seeing all these wonderful Koi and ponds but then discovering that no-one could give me answers any regarding filtration and keeping methods as the owners paid people to do this for them. Yes, we all marvelled at the Koi before us but there was little more we could do. On reflection, if I saw these same Koi today, they would be little more than fishing pond grade and pond filters seen then would be totally useless – but at that time they were the very best in the world! All through the trip my mind was set on the last leg – namely the trip to Niigata, my land of dreams that I had only read about a few Japanese publications with brief translations or overheard at Koi meetings. Yes, I finally made Niigata for a few short days and it was an experience I will never forget but being captive on a coach with some 25 other fanatics all with ready money and a desire to spend it on Koi was not the best way to go about it all. True, we were fussed over and treated like royalty but certain large breeders were warned well in advance of our visit. Although I never knew it at the time but did find it all out on later visits, one of the most ‘financially powerful’ breeders of the time was Miyaishi in Uragara and this was nothing to do with his ability as a Koi breeder because he is not even on the ‘start ladder’ when compared to the ones who are the masters – nor will he ever be. The reason for his wealth and his incredible home and facility is purely because he had the good fortune in owning an area of useless mountainside that the Japan Railway Company needed to buy in advance of a future bullet train line to Nagaoka from Tokyo. He made a significant fortune out of this and also built a dry goods outlet on the main route 17 highway named ‘FA Miya’ which traded for a few years before going into complete ruin. Sadly, ‘a fire’ started there and burned his valuable premises to the ground soon afterwards. Fortunately for the very unlucky individual, the huge insurance payout enabled him to build a large and extremely modern facility across the road in a prime spot where it remains today. Back in 1977, it was Miyaishi who ‘kindly’ paid for our coach and also ‘kindly’ guided us all through the mountainsides of Yamakoshi for those four days of fun. Alas, the only places we visited in those four days were the breeders who had agreed to give Miyaishi substantial commissions on their sales and Mr. Miya ensured that ‘Our expert Koi guides’ were present at all times to witness every single sale made – and there were some! On the road between one breeder and the next, our ‘guides’ were far more concerned with calculating and recording percentages rather than pointing out to us places of interest! The breeders of Yamakoshi know Miyaishi well, I have never once heard any bring the name up in conversation in all my visits. His lavish outlet is still there right on the main street of ‘Koi Ginza’ and he continues to pounce upon any visitor passing by – his preference is for wealthy visitors from the USA whom he entertains lavishly before they part with huge amounts of cash into his palms. He has a ‘main pond’ right in front of his indoor house, in this pond there will be, at any time of a given season, one, and only one, example of just about every variety of large Koi imaginable. He then professes to all visitors just how difficult it was for him to produce these rare and beautiful ‘one-off’ examples of world-class Koi and his necessary expertise, gained through years of trial & tribulation. However, the real truth is that not one of these Koi have ever been bred by Miyaishi. More often than not, many have mild faults and many have been bought at low prices at auctions or from other breeders needy of ready cash. One thing is certain, none of these beauties could ever come close to taking a serious award in size at any modest Koi show. They are there specifically to tempt the wealthy visitor by way of a wonderful selection of varieties in a wonderful showroom. The deals are always made more easily if a visitor has a knowledge of basic Koi varieties and points at one saying – ‘Gee, look at that Tancho Showa’! and similar. It is then when Miya San steps in and looks so surprised that his visitor has such knowledge of Nishikigoi – thus the ground is paved for the way ahead. In recent years, Miyaishi has a new overseas promoter by way of the likable rogue Martin Symonds from the UK. It is a very suitable partnership indeed. In truth, I learned nothing at all on my first visit and knew I would have to return alone if I really needed to get to the truth because there was still only superstition abounding in the UK and Yamakoshi was a closed shop to foreigners. There are others pages on this website that detail my lone sorties into the mountainsides and the beginnings of my real learning curves. I started out as a full-time ‘Koi-Only Dealer’ in early 1979, not knowing that I was the first to do so. I was also unknowingly lucky that I started around four years before the ‘UK Boom Years’ were to follow. By mid 1980, my entire house and garden contained filtered ponds full of Koi and Koi keeping items and customer flow became an embarrassment as I had one of only four outlets where Koi could be found. The Koi enthusiasts of the day had no problems at all in making 500 mile round trip to see my stocks nor did I ever need to ‘sell’ them – they just sold themselves, first come – first served. I knew I needed premises and my neighbours gave me the urge to do this after they involved our local council who gave me six moths to find other premises. I chose a large industrial building rather than a garden centre outlet – again, purely by chance and a situation of the time. It was then I took a real gamble and put all my eggs in one basket by financing, with every penny I had – and more, and then designing & building, again unknowingly, the very first professional ‘Koi-Only Outlet’ outside of Japan. It was a total financial gamble that I was constantly reminded of by close friends throughout the entire expensive build, which took me 24/7 from summer 1981 to May 1982. Fortunately sales came in throughout the build period that almost left me at ‘break-even’ point before I opened the premises to produce this finished picture. This sight is exactly what met my customers on the opening weekend, it’s the only picture I have of it. The glass cases to the sides of the central pond contained just about every Koi keeping accessory one could ever possibly require. Risky in 1982? – you bet your boots it was – it was completely unheard of back then! I still recall that same weekend of utter chaos, the car park outside was heaving with Koi visitors from all parts of the UK – all as a result of a £20.00 advance advertisement in the BKKS monthly magazine. All over that weekend, the guys helping me kept telling me of overheard conversations where it was generally said – ‘If you want some Koi, buy them now because this place will be closed in six weeks time’. On the Sunday evening after the last customer had left, I drove home and made some calculations to discover that I had taken a little over £33,300.00 in the two opening days only. In those days, a reasonably good, modest new home could be easily bought for £17,000.00. A nice new saloon car would cost £5,000.00 and, more to the point, my One-Pound sterling bought me over 700 Yen! Probably the value of £33,000.00 in 1982 would be more like £230,000.00 today? What was more important, this new funding allowed me to return to Yamakoshi and try to learn as much as possible it also gave me the purchasing power to find and buy more Koi stocks. By the end of 1982 the first container of Japanese Koi dry goods arrived and then I realised I had successfully ‘infiltrated’ the UK Koi market and now I commanded it. 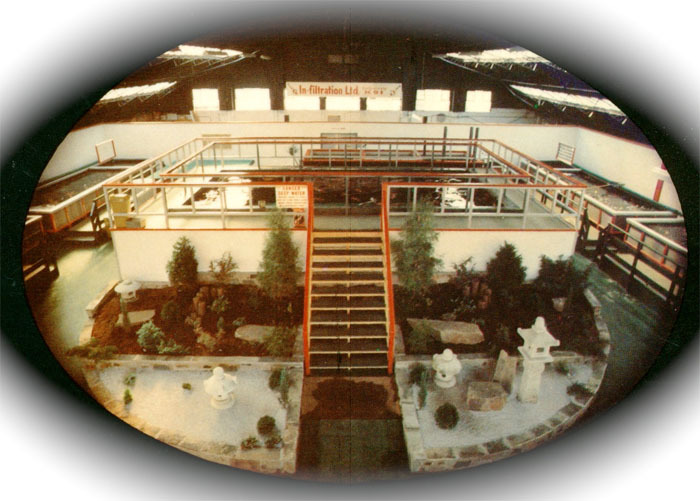 Back then, the UK seemed to be captivated with Koi and then, many other would-be Koi dealers asked me to design their new outlets. ‘Too Many Customers’ was the big problem back in those days and by 1984 I employed 12 staff and had 10 vehicles of various sizes to keep on the road. It was then I realised I had to get back to Yamakoshi as often as possible to start to learn everything possible about Nishikigoi – that’s when the learning curve REALLY started for Waddy because, thankfully, I realised my knowledge then was almost one big ZERO! It took me over 120 visits to Yamakoshi starting in the days when foreigners hardly trod those mountain tracks. Some trips were for four weeks and others up to six months. It was a closed shop only accessible to those agents from the big cities and a few who controlled them from the inside – I needed agents to turn the keys and several of these agents knew less of the geography than I did. I needed to ask questions but needed to ask them to the right people and I made many mistakes in my choices which cost more money. Throughout these visits I studied millions of Koi in all ages and slowly got to know some breeders and their villages. As with anything in this world, there is a mixture of good and bad, after many visits I became aware of the breeders to make purchases from and those to avoid. The breeders were also well aware that they were being controlled but had not the faintest idea as to just how many outsiders wished to visit them to see and buy their Koi. 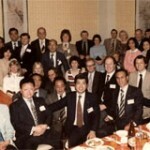 In 1993 I decided to go it alone for the first time after finally deciding that the ones who controlled it all were no longer getting any more substantial amounts of my money in return for nothing. It was far from easier both geographically and financially, some experiments were made – some failed but a few were successful. In 1995 ‘Koi Kichi’ showed a very amateur map of Yamakoshi for the first time and highlighted some of the Koi superstars in there – but it was a starting point at least. It also brought in many overseas visitors to the area who wished to see and buy Koi although they were still guarded closely by their very careful agents who professed they could take them to all the secret breeders in the area. By 1996, I had no restrictions at all, I could go where I wished, I could purchase from whoever I wished and I could send Koi to all parts of the world directly from Yamakoshi unaided. Today this is accepted as the norm but in truth it took me 19 years of my life to get there. From 1998 to 2001 my autumn visits included world class Koi collectors who found stuff that they had only dreamed of before and they bought them directly from the breeders of Yamakoshi. Today it is open to many more of these collectors but, in truth, it was all made possible to the outside world by one man only. There were a few others at the time but they wished to keep it closely guarded to themselves in a final attempt to hang on whilst the inevitable finally closed them down as the insurmountable barriers were lifted and all the ‘impossibilities’ were made possible for the very first time. It is now accepted by many as the norm! In autumn 2003, it was suggested by several leading Yamakoshi breeders that ‘Mr. Peter’ be given a reception at the Yamakoshi Village office in Takezawa in spring 2004. It was to be a presentation by the Lord Mayor of Ojiya for recognition of ‘services to the area’. Alas, in spring 2004 ‘Mr. Peter’ was not mentally able to even think about making the journey, at that time he was writing his swansong ‘Koi2Kichi’ complete with the first ever detailed map of his beloved Yamakoshi and ALL his teachers, namely the breeders within the surrounding area he had learned about the magic of Koi from over many years – and there still is that magic and now it’s free to anyone! It is 2009 now and ‘Mr. Peter’ will soon return to the part of the world that is with him every single day of his life when the time and the economy is right. There’s not many in this world who can say to themselves when awakening every morning, for the last 30 years or so, – ‘Great, I’m going to work!’ – but I can and I’ve loved every minute of it. …………I did it My Way! nobody told me about this part. Well, I might have known it, but nobody told me about this part’.